George spent most of his career with construction company Galliford, including ten years as Chief Executive. 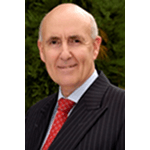 Since retiring he has been involved as non-executive Chairman and Director with a number of construction businesses, and is chair of Arden Estate Partnerships based in Coventry providing estate solutions to the healthcare sector. He has particular interests in sustainability, skills and best practice in construction, having served on various regional and industry bodies over the last forty years and being closely involved with Coventry University as Chair of Governors and Pro-Chancellor. He is currently a Governor of The Schools of King Edward VI in Birmingham and a trustee of The Engineering Council. He served in the Territorial Army Royal Engineers for thirty years, ultimately commanding the RE Specialist TA as a Colonel and serving as ADC to Her Majesty The Queen, and is currently a Board Member of the West Midlands Reserves and Cadets Association. George served as Vice Lord-Lieutenant from June 2015 until July 2017 and was the Acting Lord-Lieutenant of West Midlands from September 2015 until January 2017.